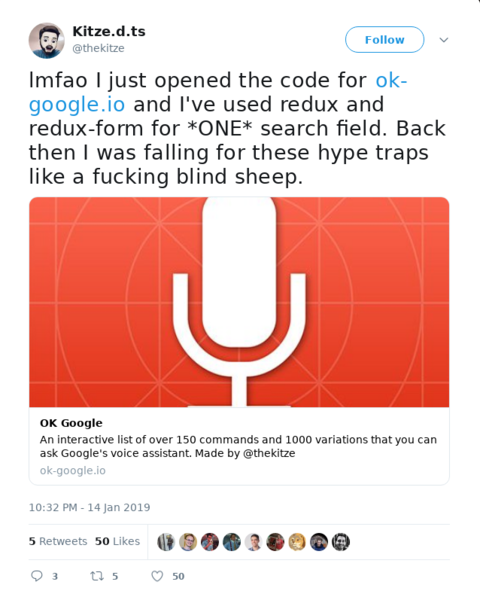 Swizec Teller published on January 16, 2019 in Front End, Technical. Wanna get a room full of React engineers talking? Mention state management. Everyone has their favorite library. The Redux camp loves their actions and reducers and sagas and whatnot. The MobX camp loves observers and actions and overwritten object defaults and magic. Both say their way is simplest. Both hide many footguns. It’s 2019. You probably don’t need a state management library. Got a simple app? A handful of properties shared between a couple components? That’s a field with a value and error state. Typing triggers the onChange handler and updates state. This triggers a re-render and users can see what they’re typing. Field validation triggers after state update, checks against some external function, and sets the error. You could use the presence of this error to make your field red or whatever. A login form can reuse this field twice. Right. It’s best to hoist your state into the form. You’ve just discovered that the form cares about this state, not the fields. The magic of asking questions to avoid building things you don’t need. error: "A lovely form error"
error: "A user error oh my"
error: "A password error oh my"
Pretty repetitive, I agree. But it works and you didn’t need no library. Same concept as before except we moved all the Field machinery into our form. Duplicated it twice for two fields and turned fields into fully managed components. You can just imagine how this code explodes in complexity the more fields you add. We can think of forms as sections of our app. Contexts. The modern context API makes it pretty painless to create ad-hoc contexts that share state among several components. We can use that to move some logic back into our fields. This creates a FormContext We’re using it in a contrived way and I’ll explain why. Same smart form field as we had before. It takes care of validation and temp value keeping internally. When it’s happy it returns the verified value to the form with the this.props.returnValue method. The returnValue method and initial field value come from context. That’s where the ContextField component comes in. With a shared context we can render these fields as deep inside our tree as we want, a different file even, and they can all talk to our Login form. We now have a form that keeps valid user and pass state, provides a change method via context, and renders fields by just giving them a name. With this approach you can add as many fields as you want with very little overhead. You could make further improvements by thinking up types of fields, passing validations with props etc. But there’s still a lot of code to look at. That’s where hooks come in. Hooks make stuff like this a breeze. useState creates convenient state management. A getter and a setter. First const is the value, second const sets the value. useEffect runs our validation method on every change of state. It’s that second argument that ensures our function runs on changes only. You can replicate the rest of our setup with useContext. You’ll wind up with similar logical complexity and much less code. Rather than messing around with useContext, I suggest using Constate. It was already my favorite library a few months ago when it was just for modern React Context. With the change to hooks it became truly amaze. Custom hook combines all the state handling we need. Our hook returns its external API as an object. Like before, ContextField is our context-based wrapper. It takes a name and uses it to get initial value and returnValue API from state. In this case it dynamically decides which setX method to use. Error is a new method. Because of context, we can extract form error handling into a new component. Once more useEffect runs our validations when user or pass change. The Login form is now our simplest component. Renders context, fields, and error.